We never know what is going to happen when we try a new restaurant. Sometimes we are pleasantly surprised, and at times we are left disappointed. 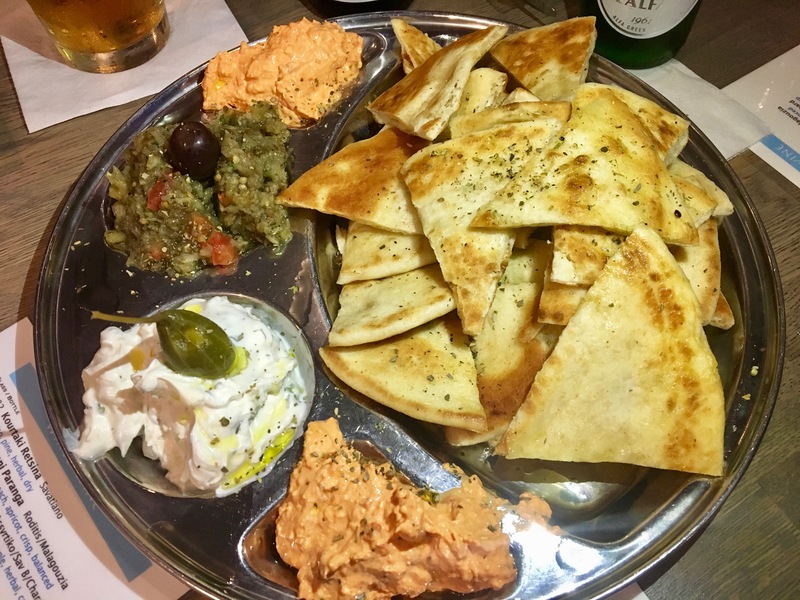 Tonight, Date Night goes Greek in Roswell and leaves extremely pleased. We are at Vaz Kouzina, which is on the northern square of Roswell. They are right on the end of the row, which affords them good road visibility. The space is not big. The bar is cool. Check out the lighting. I wonder if they can change the colors. This is basically the whole place. There are some tables not in the picture, but as you can see, there is not a lot of seating space. We went on a Wednesday, and they were full the entire time we were there. 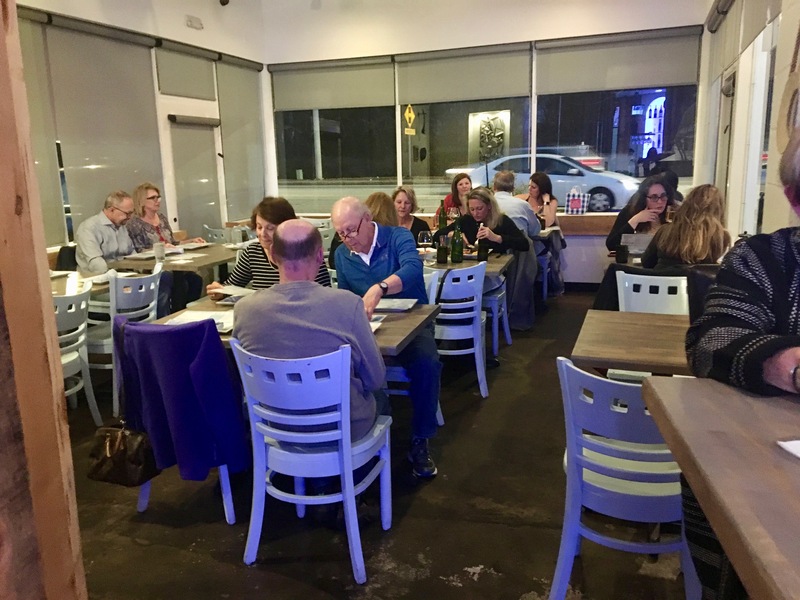 We are joined on a double date by Date Night regulars Stefanie and Bill for our monthly meeting of the East Cobb Dining Society. We all start out with beers. We choose Reformation Cadence because it’s our favorite. 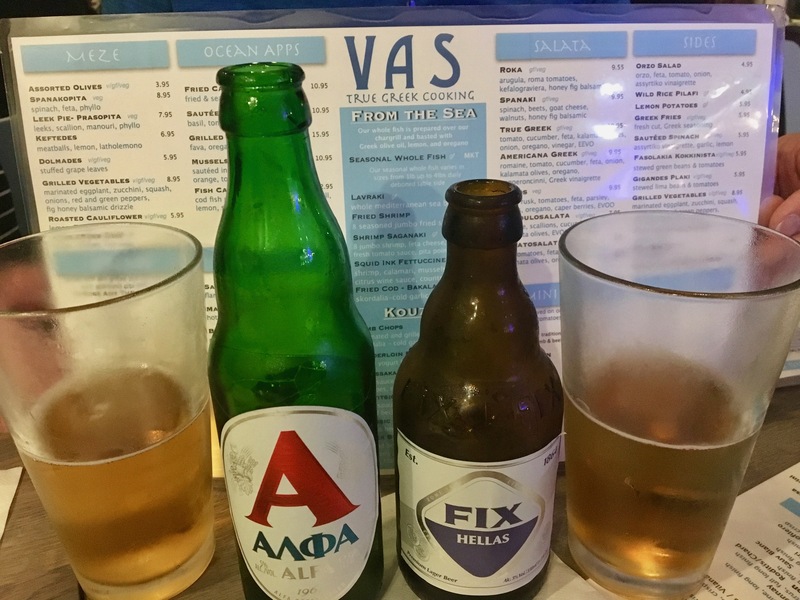 However, check out those genuine Greek beers from Alpa and Hellas. If this were a Spanish restaurant, you would call the menu “tapas”. That’s tau-alpha-phi-alpha-sigma in Greek. In other words, we order a bunch of dishes and we share them. Isn’t this gorgeous? It’s got tzatziki (yogurt), melitsanosalata (eggplant) and revithosalata (hummus) to put on those pita points. I could have eaten just this and gone home happy. But wait, there’s a lot more. 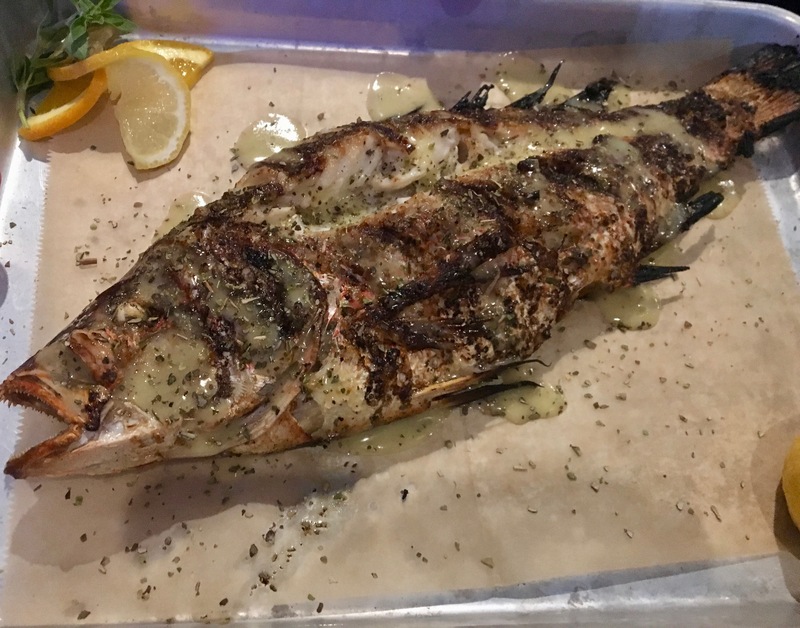 Look at this beautiful fish. The catch changes daily. 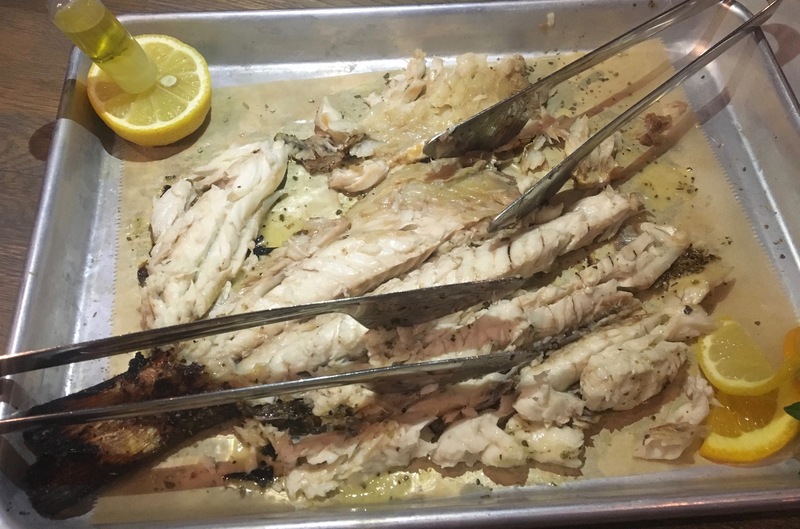 Order it and they will filet it at your table. That’s not just any fish filet-er. 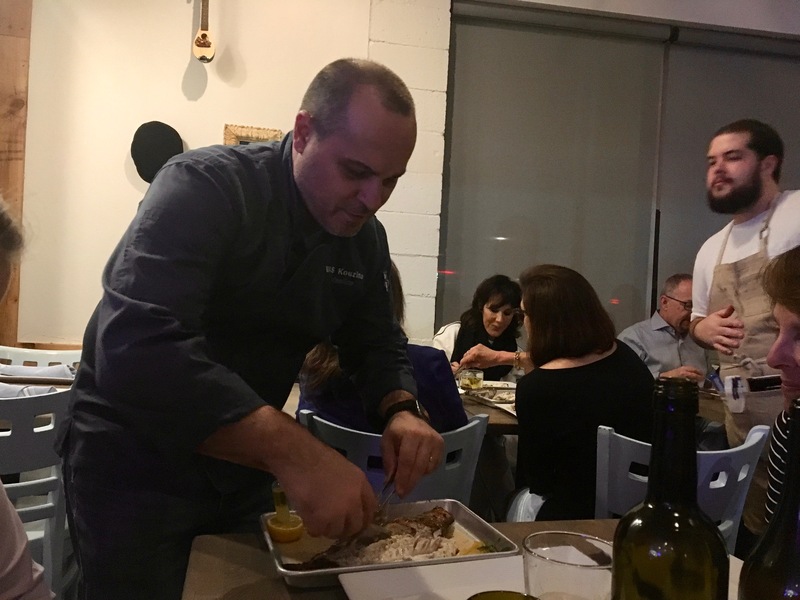 That’s Vaz owner and chef Vasilios Liakakos, who pops out of the kitchen to pop the bones out of our fish. What’s a Greek meal without lamb? 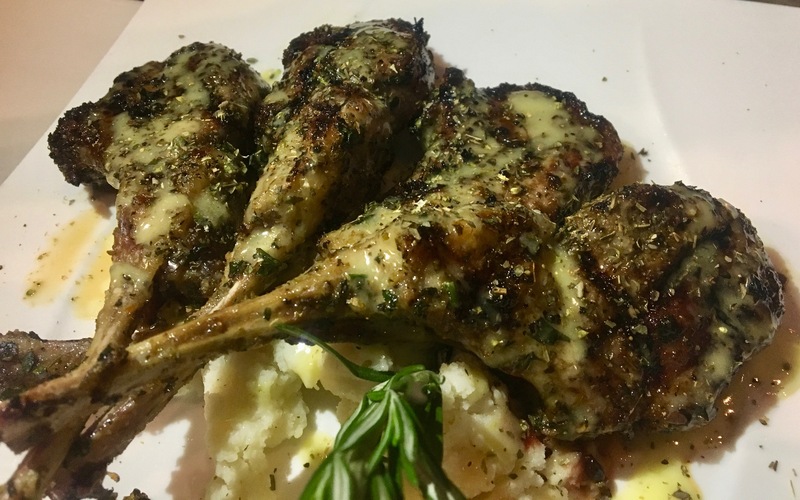 There’s one lamb chop for each of us. I found myself sucking on the bone, hoping to squeeze just one more taste out of my chop. It’s that good. We do get a couple of orders of vegetables. 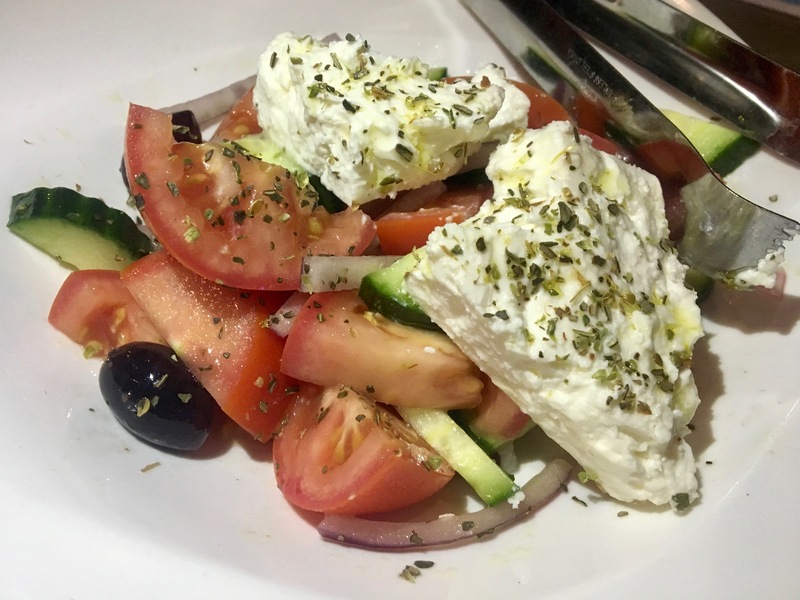 The tomatosalata comes with two perfect hunks of feta cheese. 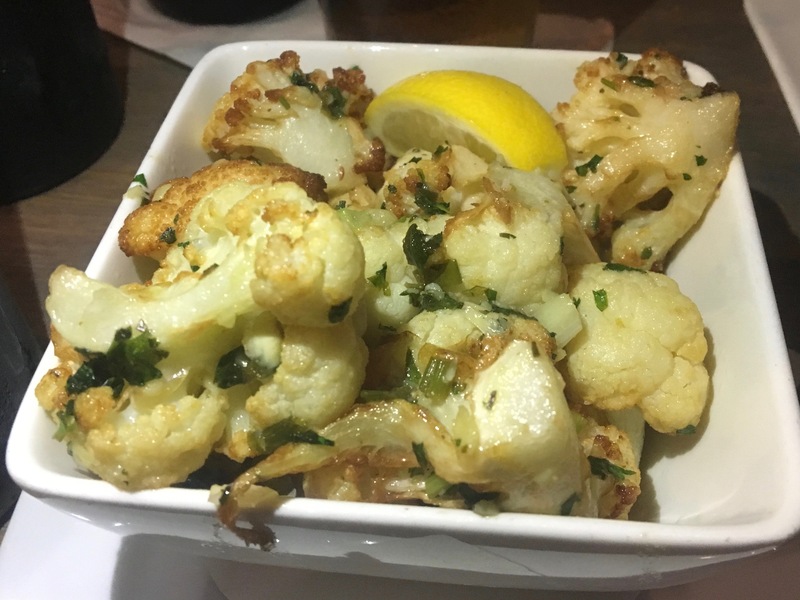 And how can you go wrong with roasted cauliflower? We are too full for dessert. Baklava is on the menu. I bet it’s as good as everything else we have eaten tonight. 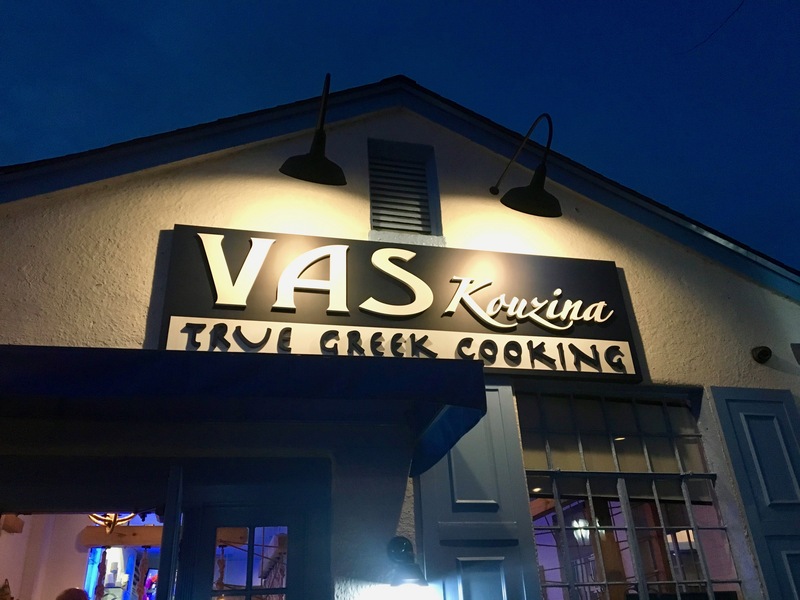 The bottom line on Vaz Kouzina: Opa! 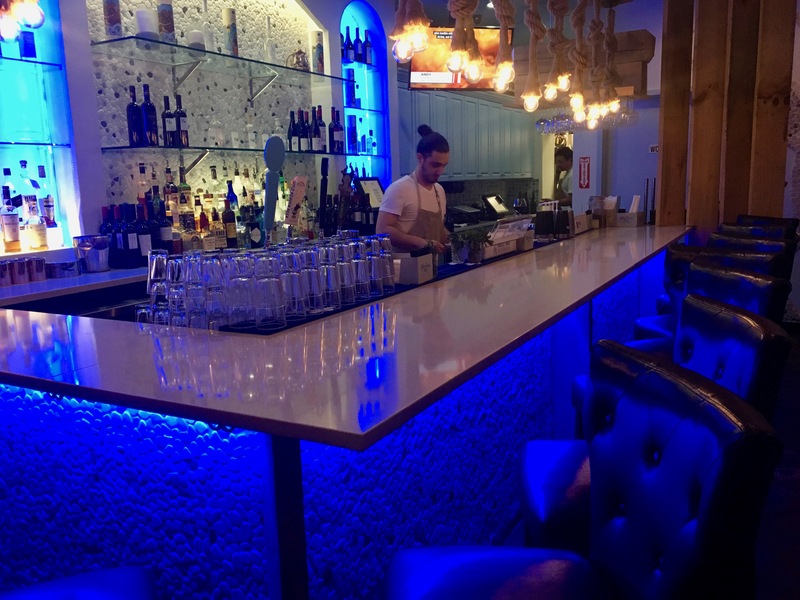 Head to Roswell for the perfect Greek dining experience. 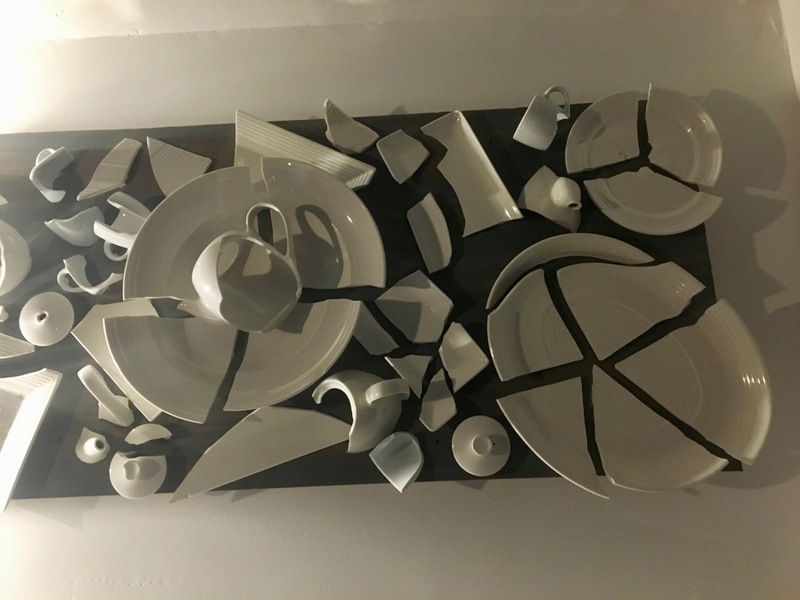 Break some plates and have a great meal.